I've recently moved homes to London because I graduated from university, and I have to say- London is one stylish city! Seriously, the people all look cool, elegant and sophisticated, which is very different from the small town vibes that I'm used to. Anyway, I recently discovered an awesome brand called Marcella Moda, which sells on Etsy and on their own website. The brand is inspired by New York-styled street wear, as well as modern, cool and edgy fashion that you can find in high-end shops. The result? An amazing range of edgy, modern clothing for women! A bit about the brand- Marcella Moda have always been in the world of arts, the world of inventing, creating, dreaming. The founders created the brand and named it after their grandmother, Marcella, the true designer and inspiration behind it all. The brand aims to create unique designs that look minimalistic, clean and simple. They also take care in the production of the garments so that it's beautiful presented and manufactured, to the highest standard. I love the edgy vibe of their designs, as they often feature cut-out shapes and angular silhouettes. I want to review two items from Marcella Moda. The first one is this amazing pair of black Slip On Sneakers- the shoe is made from real leather on the upper, featuring lines in al the right places. The top is made from a light black mesh which looks opaque but is actually not. It has a lovely see-through detail which isn't very obvious, giving it a subtly elegant and clean look that you can't find anywhere else. The asymmetric strappy detailing gives the standard sneaker a real touch of class. Take a look below at how I styled it with my camel coat and ripped jeans! In terms of the design and quality, the shoes are made with the best quality materials that you can hope for. The soles are made from a light white rubber, which feels quite lightweight and comfortable, and the top is made from the softest of materials. The inner soles are made from real italian leather, which means that it is comfortable to wear even without socks. The quality of the shoes are amazing, as everything is stitched to place well and nothing is loose or unkept. The result is this amazingly comfortable and versatile sneaker. I think you can wear this in many ways, e.g. with leggings, leather jackets and sweaters. It can even be worn for a casual walk around the park! It goes so well with any outfit, and the shoes look great from the side as they're quite slimming and narrow. 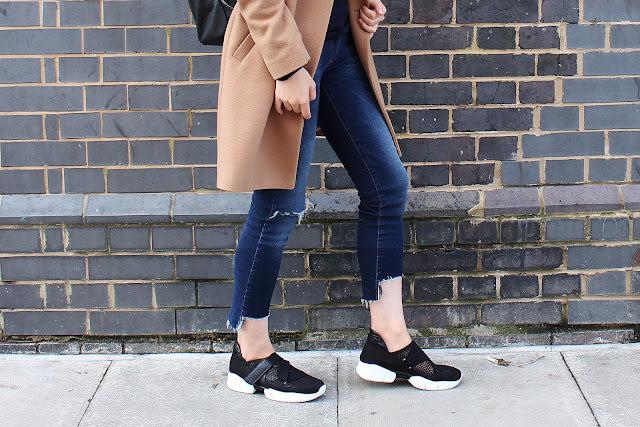 I love the pointed shape of the sneakers, as it gives an extra layer of elegance and chicness. The mesh detail is also unique and stands out from the crowds- I got a lot of compliments for these! Finally I also got this beautifully soft, elegant Summer Black Racer Top- this is no ordinary tank top because it is made with two types of a silky soft jersey. The top section is made of sheer jersey and the bottom is made from opaque jersey, which gives it a two-toned feel. This is definitely a unique spin on the classic racerback tank top, suitable for many different occasions such as formal occasions, sports and casual outfits! I like how it's also long for extra coverage and support, as most racer tank tops are short and too cropped! In terms of the quality and design, this tank top fits Marcella Moda's ethos in that it is edgy, minimalistic and unique. The quality is fabulous as it's soft and silky, and feels like a million dollars. The design is also beautiful as the high neckline of the racer top combined with the low-back details gives it a chic and cool feel. I pair this with jeans and boots, and it gives off the perfect summer look. You can also layer this inside leather jackets or denim jackets for an effortlessly cool style! Overall, I love Marcella Moda and their impeccable designs. The styles, functionality and cutting of their clothing is second to none, and I can't recommend Marcella Moda enough. Please visit them on their website (www.marcellamodanyc.com) or visit their Etsy shop!